Update: The Local is closed. In a word: Like most locals, it left us numb. 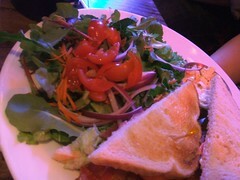 Beth ate the BLT and salad with a coffee. JM ate the Local Pig pulled pork sandwich with a lemonade. 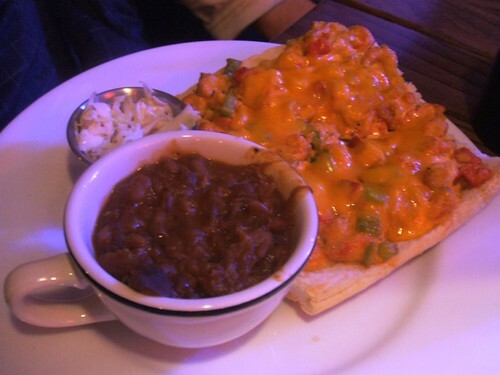 John ate the Crawfish Hoagie with baked beans and a coffee. Nichole ate the Local Hero with sweet potatoes and a coffee. Sean ate the half Tuna Melt and soup with a Bell's Tap. We split an order of wings. The bill was $67, or $13.40/person, plus tip. John gave The Local Tavern a B; Sean gave The Local Tavern a C; JM gave The Local Tavern a C-; Nichole and Beth gave The Local Tavern a D+ (see our grading rubric). It's really hard to say this because we had such high hopes for you. Some of our friends said you were really nice, and your online profile made you sound pretty sweet. Group dating is always a good idea with someone you want to get to know better and so John, Sean and Beth joined us for our night on the town with you. Well, I have never been so disappointed with a relationship. Things started with you ignoring Nichole when she arrived a little late. 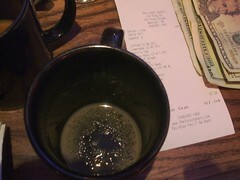 Of course, you were taking forever to make that generic coffee you serve and when it did come it came with grit in it. It takes so many little things to make a relationship work. One of them is the menu. There were more differences between your website and your menu on the door and the marked up menus that you gave us all to read - talk about sending mixed signals! Are you that afraid of commitment? 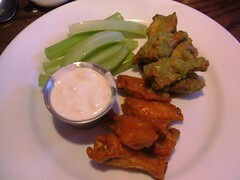 Your red and green hot chicken wings were OK. (I don't want you to get a complex or anything.) But again, your online menu said the red ones were hotter than the green ones, which was just the opposite. The menu also said free refills on soda, but you billed us $2 for each glass. That drives us crazy! John said that he liked your "personality" and your "ambiance" and your "Crawfish Hoagie," especially the side of pork and beans with lots of pork in it, but he's a bit of a pushover. And you know we all liked your BBQ sauce, though why you served it in cups the same size as the ones for your coleslaw is weird. The rest of our friends thought your were boorish and incompetent. (We should have known when our friend Linda rolled her eyes when we said we were going out with you.) Beth said she found a caper in HER SALAD. The salad didn't even come with capers! And the bread on her sandwich was white, when she asked for wheat. Sean thought that other guys with places on the square would have offered us something better as a signature gumbo. Friends we can trust - you have to go. Oh, and you really need to do something about the people you hang out with. They cannot go around chasing people on the way out the door cause they screwed up their bill. And the person who took our order tried to overcharge us too! What is your deal? 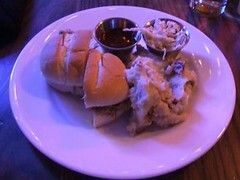 It takes give and take to make a relationship work and you take our $8 and give us the smallest little sandwich ever. Sometimes it feels like you're not even the same person. I mean, look at the size of the Local Hero sandwich compared to your other sandwiches. But $13 for a steak sandwich that can't be bit through, with a side of potatoes (when we asked for sweet potatoes), is a little steep. There's a fine line between being spontaneous and just being random. Maybe we just needed more time to build up some trust in a new relationship, but we were with you for, like, almost three hours. The next day when we called to check in (because we thought we left a bag at your place), you let the phone ring 20 times. Then you pretended that you couldn't hear us. Your drunk jerk friends were in the background, and you hung up, and then you wouldn't pick up when we called again. Thank goodness we found our bag in the car - that would have been a walk of shame we would never live down. Don't call. Don't write. We can't even be friends. If you decide to move let us know. We see some great potential for your place. truly terrible. if you drink like 6 beers before you eat you won't notice the poor quality though. Thanks for the warning - I have walked past this place thinking of going some time for dinner. I will now continue to walk past it and head to better places in the area - like the Dane. Good restaurant guy doesn't equal good restaurant owner. The place is a joke. This is why I keep coming back here. Humorous, honest reviews. If there was eye movement, I think I was just raising my eyebrows. Sometimes after a bad relationship you look back and think of everything as a warning sign for what was ahead. Sometimes these are real, sometimes imagined, sometimes merely coincidental. Hey, I just want to clear something up. If you dined on Friday, 4/4, I was the guy that got chased out of the bar by the server. She didn't screw up the bill - it was my bad, I shorted her on the bill (oh happy hour!). I'm just glad she caught it. I might be the only one here, but I like the place. Good selection of beers on tap and good bar food. Hey, it's not fine dining but it sure beats Madison's! Witness the power of the internet! Thanks for the correction. Hilarious! A break-up-letter-slash-restaurant-review. You guys are the BEST! I am so glad I read this. I am a sucker for low-class jerks, don't tell my boyfriend. But there is a difference between a real jerk and a guy with a rough exterior, sounds like you found one with both. So long Local Tavern, may we never meet or date! Hilarious review, but I have to disagree. I've had a number of good meals there and no bad service. I haven't eaten any of the items you tried so maybe my tastes match better to what they good at (try the snapper sandwich!). I'm the new manager of The Local Tavern. It may be uncouth for restaurant managers to respond to online reviews, but I just wanted to let you know I appreciate hearing these things. I cannot agree more about the menu and we are having new menus printed on May 1st. It will be simplified and more in line with a "good bar food" kinda place. Overall, most people have been very understanding about the time it takes to shift these things. We usually hear nothing but great things about our food. I'm astounded at your comments about the service. I hope to assure you that this is not the norm. I know we have had service issues in the past, but I thought we had worked them out. Believe me that I take good service very seriously. This review has not gone unnoticed and we will continue to move forward. I hope we haven't lost your business for good, and I hope anyone reading this review will give us a chance and decide for themselves. professional review site, as we only go to a place one time. We always leave the comments open for on-topic posts, especially those that indicate that a restaurant has changed. Thanks again for reading. if the menu is changing then i would consider returning. after all, there aren't many restaurants in madison. That soda thing is enough to keep me from ever going back. I hate it when places nickel and dime me! this was the worst dining experience of my life, hands down. bad food, AWFUL SERVICE, bad drinks, bad time. I was at the Local Tavern last week. Yeah, service was a little slow. Yeah, the Tomato Bisque soup resembled spaghetti sauce, but overall, we really enjoyed ourselves. I had the most excellent Bloody Mary...made to my specifications. 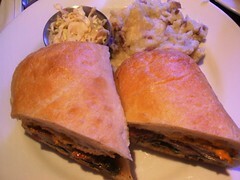 Our sandwich was great and best of all, this good time was $27.00! We loved the ambience. We will go back again.